It’s always a good idea when you are feeling overwhelmed with your life or confused about issues or direction, to tackle the piles of clutter. Our garage has been storing items from our son as well as boxes of things we could never decide to throw out or keep. It’s also the place where stuff that was in the car gets tossed and stray boxes from school and finds from the alley get stored. Today was the day. JB and I tackled the piles. And we were ruthless. There’s still a bit more to do, but the majority has been sorted, neatly stacked, but mostly trashed. 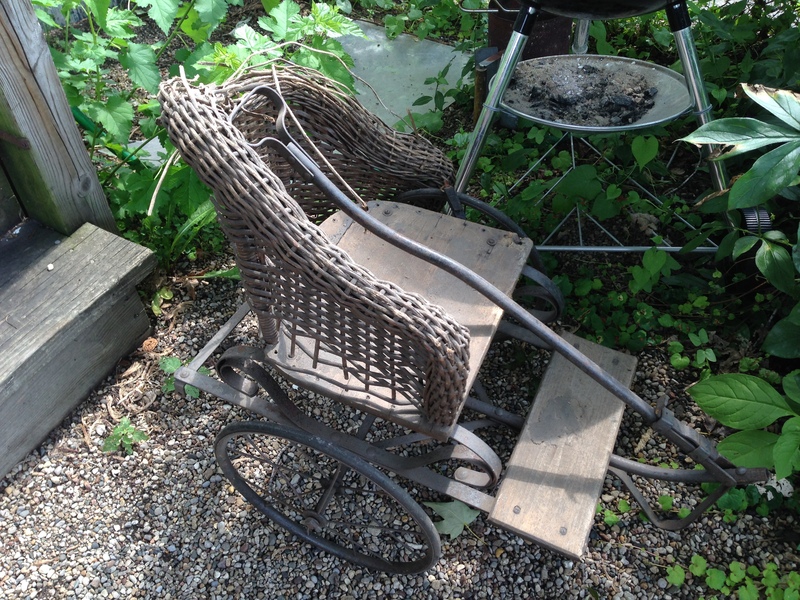 One alley find, an old woven kid’s carriage (photo above), has been liberated to sit in the backyard eventually with a potted plant in its seat. I’m not sure the physical act of organizing has deeply affected the piles inside, however it sure feels good having done this work. We all have to start somewhere. This entry was posted in home, organization and tagged cleaning, clutter, de-clutter, garage, organizing. Bookmark the permalink. Organize your closet, organize your mind!